Only few weeks left before the most romantic day of the year, and if your partner is of the fashion-fanatic kind, you have to be very careful when choosing the gift. 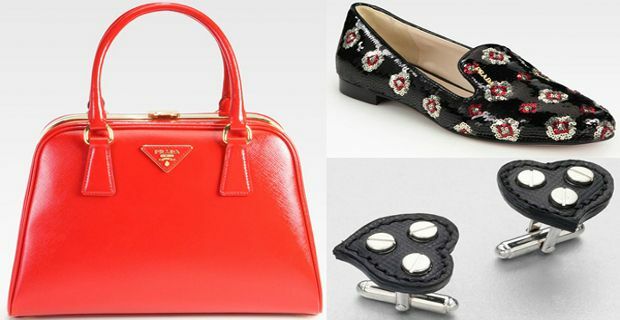 Here's something that will surely make even the fussiest fashionista happy: the latest collection of luxury themed accessories by Italian brand Prada. One of the most interesting piece of the collection is the exclusive bright orange Saffiano Vernice Frame Pyramid Top Handle Bag. The unique shade of the bag is able to liven up any outfit and the classic shape goes well either with jeans or a little black dress. If you want to spoil the love of your life and splurge on her look no further, the latest Prada bag comes at a passionate £1,950. The über-trendy Flower Sequin & Patent Leather Smoking Slippers are perfect for a romantic night out, covered in shiny sequins which draw a retro flower pattern, this shoes are timeless and unique. Fantastic with pencil trousers and androgynous jacket. They come at the heart breaking price of £625.00. Prada has also thought about the men, who can embellish a classic white shirt with Saffiano Heart Cuff Links. Made of black leather and silver studs, these cuffs come at a relatively affordable price, £185.00, and are a very stylish gift for your romantic, yet rock and roll heartthrob. For the young hipster, Prada has created the dashing Pebbled Leather Portfolio, £740.00, which comes in a choice of red or gray. The quirky case is an absolute must have and complement any casual but refined look, whether you are having an after work drink or a quick sushi bar dinner. For the man who is comfortable in his own shoes there are the exciting Prada Spazzolato Tricolor Kilt Lace-Up. If you are looking for the special one this Valentine these fashionable loafers are certainly going to catch someone's attention. Comfortable and highly resistant they have a heart-warming price tag of £430.00.